***The price is $32.00 per child. The birthday boy or girl and one parent of the birthday boy or girl are complimentary. ***Parents accompanying their children into the park who are not participating are $12.00 each. ***The mimimum number of children for a birthday party is 12 children (excluding the birthday child & 1 parent). ***Birthday parties are only scheduled on Friday, Saturday, and Sunday at either 11 a.m. -2p.m. or 2:15p.m. - 5:15p,m. ***A minimum deposit of $50.00 is required to reserve the date and time of your party. ***Group rates are offered for 20 or more guests. 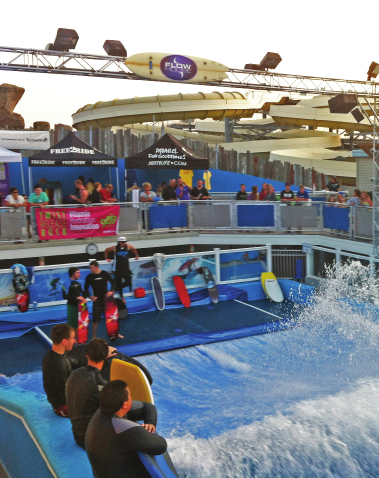 ** Children under 42 inches are not permitted to ride our Flowrider but can participate on all the activities in the rest of the park. Rates will be modified if your group has any camper who may fall into this category. *Any group over 150 people, please contact us by phone. 1 round of golf (18 Holes) –Add $5 per guest. (1 round of golf for both courses, total 36 holes $8.00 per person). *** A 20% deposit is required to hold a reservation for a specific day and time. *** Please note that once a date has been confirmed we will send you a confirmation letter that will need to be signed and returned with your deposit. ONCE A DATE IS CONFIRMED, THE DEPOSIT MUST BE RECEIVED AT LEAST 30 DAYS PRIOR TO THE DATE YOU REQUESTED IN ORDER TO RESERVE THAT SPECIFIC DAY AND TIME. DEPOSITS ARE NON REFUNDABLE. ****Food Vouchers are available upon request.